Scot Eckley Landscaping Blog » Thanks Sawyer! 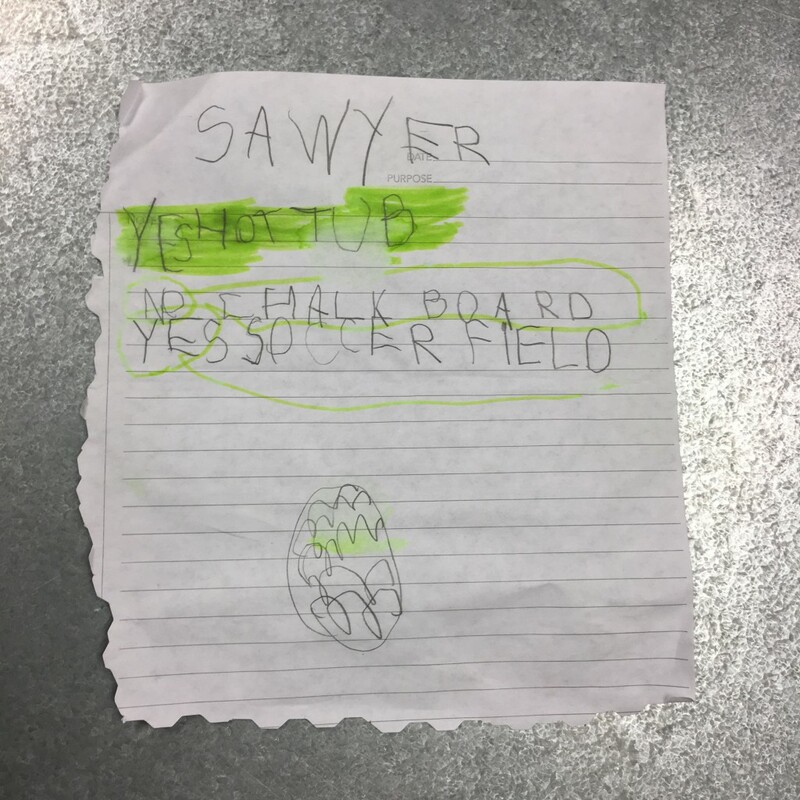 Recently,Â I was getting ready to leave a job site when the client came out and said her 5 year old son had something for me. Â I went inside and he gave me a Â ‘work order’ with a few things he wanted included in the garden. He let me know that he definitely didn’t want a chalkboard outside as he and his little sister already had one inside.Â However, he was adamant that we include a hot tub and soccer field in the plan. The picture at the bottom of his work order is a hot tub. We designed the backyard to be a very fun, interactive and adventurous play space for Sawyer and his sister. Â Part of this includes five large circular steel planters. Â I jokingly told his parents we could leave one of the circular planters empty and line it with a blue tarp. Â They could then fill it up with warm water – and voila – they would have a hot tub. Â If you want a good laugh, do an Internet search with the keyword “blue tarp pools” or check out this link to see DIY hot tubs. Tags: Garden Elements, Inspiration, New Projects, Uncategorized // Comments Off on Thanks Sawyer!